A while back, I tried collard greens for the first time and loved them. So when they appeared on sale again, I knew it was time for more. 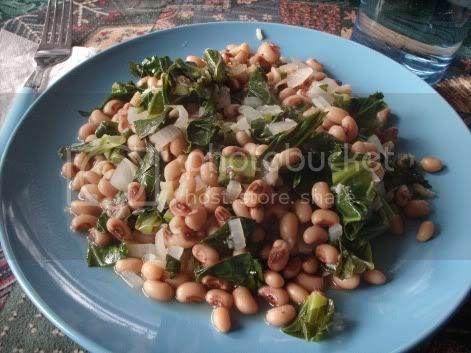 I’m only vaguely familiar with the Southern tradition of black-eyed peas and collard greens, but it’s something I’ve been wanting to try. I picked up a can of black-eyed peas the last time I was buying beans with the idea of looking up black-eyed pea recipes at some point. Fortunately for me, the can was still around, so I was able to seek out exactly the sort of recipe I was looking for. 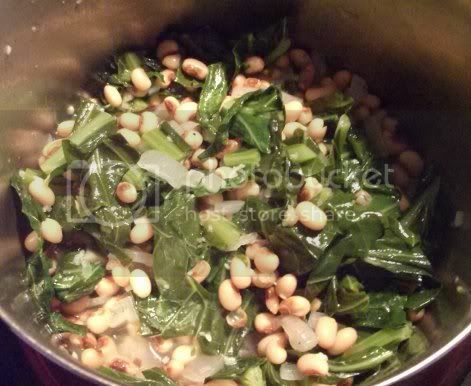 Straight out of Vegan Fire & Spice, spicy black-eyed peas and collard greens! This is a pretty straightforward recipe. Onions, garlic, hot chilies, and ginger make up the seasoning along with a little water to cook the collards in. All together it makes a sort of broth that smells like ginger and dark leafy greens while it’s cooking! I made some brown rice to go with it, and man was it good. Sometimes the simplest stuff is the best, and such is the case with this recipe. And I love black-eyed peas now! So much so that I’m ready to go get more and try other black-eyed pea and collard recipes as soon as possible. No reason not to, really. You can’t go wrong with beans, greens, and a little creative seasoning, right?